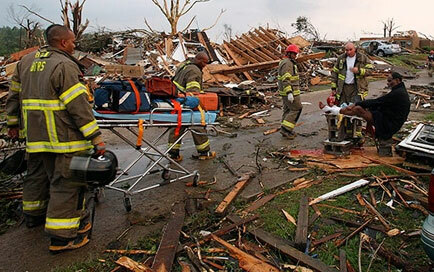 Did you know that you can donate your Swagbucks towards tornado relief efforts? Swagbucks members helped raise funds for Disaster relief in Japan by donating their *Bucks* via the Swagbucks website, and thanks in part to your efforts, donations totaled at over $20,000 to All Hands Volunteers. 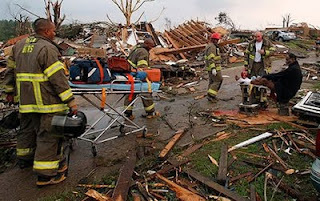 Now they've turned attentions home, where the Southeastern U.S. was hit with over 250 tornadoes in the span of 24 hours. They are currently collecting Swag Buck donations through the month of May that will translate into a donation for United Way of Western Alabama. The damage is impossible to imagine. Don't you want to help? Swagbucks has found a way to help YOU help those in need without ever actually opening your wallet. Can you imagine a more simple way to not impact your own budget than donating some of your Bucks? I mean, you know you're going to search some more, you're going to play games, you're going to earn them again in an instant! So share the proverbial wealth and pass along a few to help support the relief efforts. You'll feel really good once you do! Here's the link to the donation page: DONATE NOW! Sign up through my referral link and enter the code MEMORIALDAY when prompted - it'll pad your account with an extra 50 Swag Bucks on top of the 30 that everyone starts with. Get started earning your reward points today! Swagbucks, the best place to get free stuff from searching and more is celebrating Memorial Day this week with a special promotion and tomorrow there will be a huge Swag Code Extravaganza, a day filled with fun, games and the opportunity to snag over 40 Swag Bucks worth of codes throughout the day. Be sure to visit Swagbucks all this week for opportunities to win big, and after you do so you'll have even more Bucks to donate to this worthy cause. I've already sent in 100 bucks, and plan on donating again later this week after I make some more. Thanks for taking the time to help. And thanks to Swagbucks for continuing to support our friends in need.